Thyroid, Parathyroid, Adrenal, Endocrine Surgery, What is Bartter's Syndrome? The pathological hallmark of this hyperreninemia is juxtaglomerular hyperplasia (increase in the number of cells in a certain area of the kidney nephron). 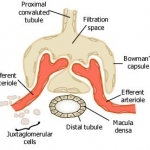 A diagram showing a layout of the glomerulus is shown below. The syndrome presents in childhood with failure to thrive, polyuria (increased frequency of urination) and polydipsia (increased thirst). The blood pressure is normal and there is no oedema. Gitelman's syndrome is a milder version of Bartter's syndrome but is associated with hypocalciuria (low levels of calcium in the urine). The reason for this low level of calcium in the urine is not fully understood, but is used to distinguish Bartter's from Gitelman's syndrome.